Eases tension and stimulates blood flow. Provides relief from plantar fasciitis and other foot pain. Directional pattern that enhances blood flow. Ease tension, stimulate blood flow and provide relief from plantar fasciitis and other foot pain with Gaiam Restorer's Dual Foot Massage Roller. Two massage options include a directional pattern that enhances blood flow and a muscle-releasing cobbled texture. 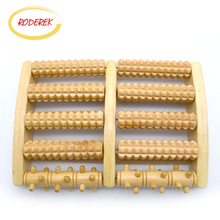 Great tool for stress relief, relaxation and soothing comfort for your body.Touches and applies perfect pressure to most relevant points of your foot.Relax and soothe stiff muscles. ✔RELAX: Designed to stimulate & release tension in the feet. Use at home or at the office. ✔THERAPY: Helps relieve plantar fasciitis, neuropathy & other foot conditions that cause foot pain & aches. ✔UNIVERSAL: Suitable for all feet size, ages and compact enough to bring around. ✔QUALITY WORKMANSHIP: Top grade, polished Theaceae wood. Handcrafted quality you can trust..
✔SATISFACTION GUARANTEED: Covers defects/ damage. We will replace or refund your purchase if you are not satisfied. Simply contact us via this link: https://amazon.com/gp/help/contact-seller/contact-seller.html?sellerID=A26KVBHOVMLANB&marketplaceID=ATVPDKIKX0DER&ref_=v_sp_contact_seller. Say Goodbye To Foot Pain & Body Aches.Are you troubled by foot pain? Afraid to take that dreadful first step in the morning? Or does your body & feet feel sore and achy from standing or walking the whole day at work? Now, with the TheraFlow Foot Massager you don't have to spend a fortune on expensivetherapy or devices like foot rollers or massage balls that do not work. 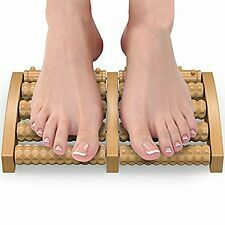 This is a truly simple & effective solution to roll your woes away.---------- Benefits ----------✔ 2 Independent Rollers Mean You Can Use It On Both Feet At The Same Time.✔ Nubs & Ridges Designed To Knead Away Knots & Tension In The Feet ✔Great For The Foot Arch Area - Perfect Even If You Have High Arches✔ Super Light & Portable: Use It Anywhere You Go. Easily Stowed Away In A Backpack -------- Buy Risk Free --------This Product Is Covered By Our No-Hassle Guarantee. We will replace or refund your purchase if you are not satisfied with it. Simply contact us & we will do our best to resolve any product issues for you.Do yourself & your feet a favor today by getting the TheraFlow foot massager. Click on the 'Add to Cart' Button Now!